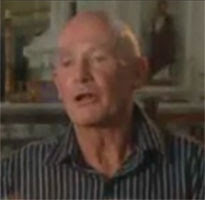 Father Peter Kennedy is the priest of St Mary's Catholic church in South Brisbane. He's been a very naughty boy. Catholic Archbishop John Bathersby yesterday excommunicated Kennedy, an extremely rare occurrence. This followed complaints he and St Mary's was no longer "in communion with the Roman Catholic Church". You see, 71-year-old Kennedy welcomes anyone into his church. He has one of the largest followings in the country; allows women to preach; indigenous folk dance and sing at services; blesses gay couples, and encourages the members to design their own prayers for the Eucharist. I know first hand the over-whelming weight of Catholicism. The guilt. The non-questioning of doctrine. 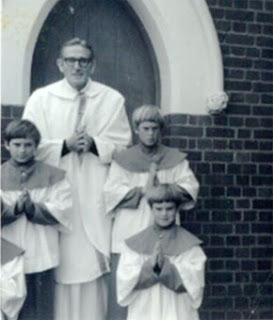 I, along with my three brothers, were altar boys at Mary Immaculate Convent, situated in New Zealand's South Island beachside community of New Brighton. Here's a pic on the four of us. John, David, Chris and I'm on the left (always have been). I don't tell a lie, for fear of being zapped from the High and Mighty, but have been cut off magically by the photographer - probably my mother. And there's the staunch chain-smoking Irish Father McKail. It was enforced brain-washing, of the most peculiar type. I doubt my 83-year-old mother reads my Blog. I don't think any of us boys go to church anymore. A natural rebellion of being forced all those years ago I guess. I'm not doubting that it instilled some sense of moral code, but the ability to question and ask, was absent from the church and the adjoining Catholic school we all attended, run but a troop of fierce nuns, often armed with rulers for compliance. Reformed and lapsed Catholics alike will know what they were for. So I can understand about the wrath bearing down of Father Peter Kennedy by the Church at the moment. An obviously angry Archbishop was not impressed that his directives were ignored. "I have repeatedly asked for changes but you and the community have not budged an inch," he said in a letter to Kennedy last week. "Moreover, South Brisbane’s instant disclosure of my letters and comments in the media gives me no reason to enter into discussion." "I will terminate your appointment as Administrator of St Mary’s Parish effective Saturday, 21 February 2009 unless you were to resign beforehand," Bathersby said. He didn't resign. Following the termination directive, Kennedy said he will not go, and the Archbishop said he will get the Police to remove the priest if he doesn't on the 21st. "Peter you have already claimed in the media that you may lead people who desire to follow you into a breakaway Christian community elsewhere in South Brisbane," Bathersby said. "I cannot stop you from doing so. However those who follow you should realise that they will not be in communion with the Roman Catholic Church or the Archdiocese of Brisbane. This show is certainly not over yet. Listen to this Podcast of an amazing edition of ABC's Conversation Hour when Richard Fidler chatted with Father Kennedy last week. A big thumbs down to the Catholic Church hierarchy in Brisbane for sacking the visionary Father Peter Kennedy. As usual, anyone who dares to put into practice the teachings of Christ is condemned by the Church. Father Kennedy has been relieved of his position as parish priest of St. Mary's, South Brisbane for being a true embodiment of God's grace. His cardinal crime was the exercise of acceptance, love and true inclusivity, welcoming all to his church. The good Father Kennedy is known for blessing gay couples, encouraging the active involvement of women in sacramental activity and even acknowledging the power and importance of religious traditions other than his own. In 20 years time priests like Father Kennedy and parishes like St. Mary's will be the norm in Australia. For now the Church must hang its head in shame and Archbishop Bathersby must prepare himself for an eternal place in the rogues gallery of the religious wicked who tried to stem the tides of love and compassion and stake a claim for legalism and all that is wrong in organised religion. The Church has really made a terrible error in this case. As Macauley so brilliantly pointed out, the great genius of the Catholic Church through the ages has been in its ability to absorb its rebels. Simply shifting over and making a place for even the most radical ideas has meant that the Church has remained dynamic, varied and unified for a very long time. But perhaps this is just a temporary blip, similar in kind to the excommunication of the Blessed Mother Mary Mackillop. Perhaps in a hundred years time we'll be celebrating the beatification of Father Kennedy. I think there's a very real possibility of that. Father Kennedy is a great man, and has single handedly done more for the reputation of the Catholic Church than almost any other cleric in recent memory. Who then should I believe when there is a dispute? you? Who is the voice of the Truth in Christ regarding cloning, abortions, stem-cell and a lot more daunting moral issues? you? What do you think is christianity all about? DEMOCRACY? Finding TRUTH with the majority votes? Christianity is about rules-rules of GOD found in the Bible. If you join country club or any club - there are always "rules and regulations", if you don't abide and like them then NOBODY is forcing you to join or stay, do you follow? same with the Catholic Church. If no one is pope then everybody is pope! This the reason why Jesus Christ founded His Church. The Catholic Church in my experience cares more about real estate and getting new followers than saving souls. Jae's comments are the result of successful indoctrination. JC was a man of his time and a visionary with a message which did change the world. The problem with Humans is power corrupts and the leaders of the church over the centuries have abused this power for their own benefit. Good on Fr Kennedy for having the strength of his convictions to shake the catholic proletariat. Rules Rules Rules as long as they make sense are important and useful. So Jae how do you explain the rule that Priests/Nuns should be celibate? Why can only men be Priests in the Catholic church? Why is it so wrong to use a condom? Do unto others or they'll do you.